The island of Cuba – with its vibrant rhythms, varied landscape, and rich heritage of literature and dance – wins over many travellers, who return again and again. Cuba's travel opportunities differ from those in other Latin American countries, and though the country has been a magnet for sun-seeking tourists for some time, it is only slowly opening up to less-traditional travel. A Cuba trip provides an opportunity to explore this uniquely beautiful and captivating land and meet its friendly and open people. Our connected CEOs know where to go and can’t wait to take you along for the ride, whether its by navigating the bustling streets and alleys of Havana or searching for an untouched beach along the coast. Cuba is the sort of place that doesn’t just get under your skin; it seeps into your bones. All you have to do is let it in. Arrive in time for the 3pm welcome meeting at the joining point hotel. After, travel to Cienfuegos and spend the night aboard the catamaran. After breakfast, set sail from Cienfuegos and head towards the Canarreos Archipelago. Travel among the islands of the Canarreos Archipelago and spend the next five days soaking in everything these island communities have to offer. Discover paradise among the rustic, sparsely populated islands, go snorkelling, explore secluded beaches or simply relax on deck. Wake up and admire the view from the lighthouse in Cayo Guano. 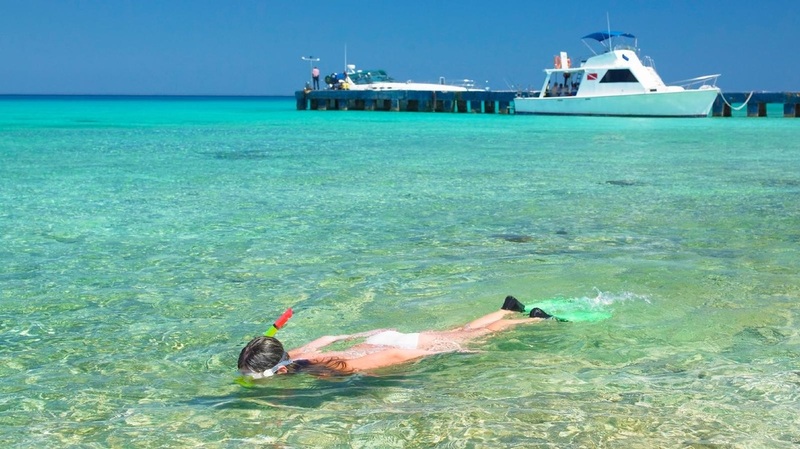 Enjoy one last snorkel before sailing back from the Canarreos Archipelago to the town of Cienfuegos. Enjoy some final time on deck, and keep an eye out for fish and other marine life along the way. 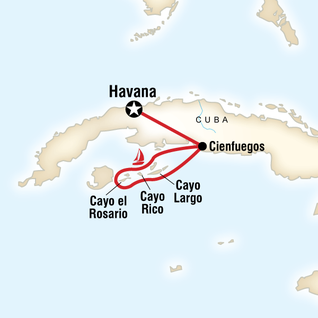 Depart Cienfuegos after breakfast and arrive back into Havana around midday where the trip will end. After being dropped off at the hotel your CEO will be able to help with onward travel arrangements. Hotel (1 nt), 7 twin/double bed cabins, all with en suite bathrooms (6 nts). Allow USD20-30 for meals not included. While on board, drinks are available for an additional charge. Non-alcoholic beverages, spirits, and beer is available for 1-2CUC, and bottles of wine are available for 10CUC. Chief Experience Officer (CEO) throughout, skipper and assistant/cook. With room for 14 passengers and a crew of three, our Cuban catamaran hits the sweet spot between spacious and cozy. Stylish looks spread across 24 m (79 ft) of twin-hulled sexiness, you’ll find plenty of interior and exterior space to lounge about when you’re not exploring Cuba’s shores or diving into her crystal-clear waters. If you have been looking for a unique way to experience Cuba then look no further! Contact one of our Advisors today at 250-753-2282 or by clicking on the "Contact Us" button.